Black Ice Software - Tiff Viewer version 11.54 is released! Tiff Viewer version 11.54 is released! Please note that this coupon can only be redeemed for new purchases. The Black Ice Support form generates a ticket number which you can refer to in the future. If you no longer wish to receive our newsletters, please click here. Black Ice Software has released version 11.54 of the Tiff Viewer. This version includes a newly improved Optical Character Recognition (OCR), providing more accurate and efficient conversion of typewritten or printed text into editable text files. OCR is widely used as a form of digital document processing for documents, sales receipts, mail, or any kind of scanned documents. 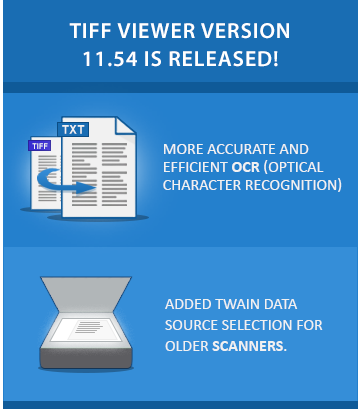 The latest Tiff Viewer comes with an improved user interface allowing Users to quickly select the TWAIN data source version. This will improve compatibility with older scanner devices using Twain DSM version 1.9 or earlier lowing the number of errors that may occur when scanning.